Garden is resting. We are mostly eating the few things that are still gowing in the snow (Cabbages, Sunchokes), stuff that we have indoors, canned or in the freezer (like pumpkin, potatoes, tomatoes, spinach and swiss chard) and stuff that we have growing in our basement (lettuce, rocket, baby spinach, basil, parsley and koriander). Many of the Raised Beds are covered with snow. Under the snow things are however happening. A thick layer of grass clippings, leaves and other organic material is covering the soil and providing a nice environment for the worms to work and build a great soil for the spring. It’s time to start some seeds for early spring harvest, first in polytunnel and then outdoors. I make sure not to start everything now, only things that requires and early start or can handle cold spring climate. I’m sowing chillies in december or january and transplanting them in january or february. I’m not a huge fan of growing chillies - but since I can’t wait to do some gardening in January, I’m always thankful to have them around this time of the year. I’m usually done with most planning already, and now it’s time to plan what varieties to grow and to order the seeds that I need. I'll keep you posted on what January brings for me this year. What are you doing in your garden in January? First thing started this year is chilli, pepper, eggplant and artichoke. I keep them in room temperature until they have sprouted. (I then move them to the basement after first transplant.) To make them extra warm and comfortable I add some grow lights for them. Any lamp will do. This year I use red grow lights. It's a nice and cold day - but still not snowy. Garden is resting and a few things like Kale is still going strong. 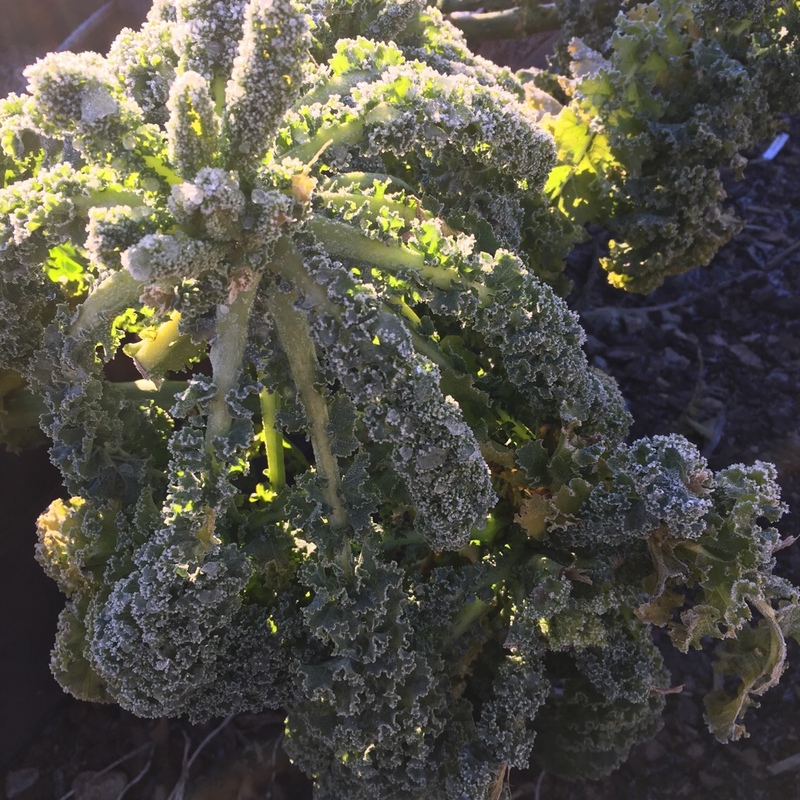 The greenhouse is covered with ice on the outside, but the soil is not frozen inside. Will be great to start the sowings in here in a few days! Starting batches of basil, parsley, lettuce and rocket to grow indoors in the basement. Also starting Pea Shoots for the basement. They are lovely and will grow fast. Chillis are coming along nicely indoors. I have started transplanting a few and are moving them to the basement after transplant. Weather has been good for Winter Sowing and half of my planned early outdoor sowings are done. I'm being a bit lazy with the outdoor pea shoots this year and are trying to just scrape the snow of and sprinkle the peas on top of the frozen ground. Let's follow up later this spring how it works out! Winter sowing in the greenhouse now will give me a nice and early start. It's loads of snow outdoors and a few degrees below freezing, but the ground is not froze inside the polytunnel. Easy to scrape the mulch of and start sowing!